When I saw the collection by Lubov Tumanova on on Day 4, I knew immediately that this show would need to be in a write-up on it's own. I am not often surprised, but this collection did just that. 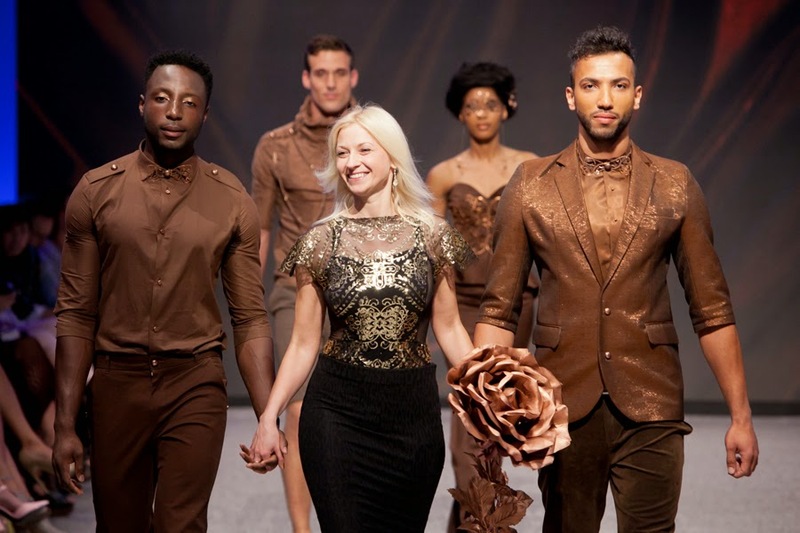 From the palette created in hues from brown to rust, to the beautiful styling and incredible accessories, there was just a mood to this show that drew the audience in and held them from first look to final bow. I wanted to share this opening look separately as everything about it is just right. The willowy model, the fluid flow of the skirt as she walked, the long beautiful copper dress that perfectly matched her hair colour, the softly feminine hair and make-up choices and then as a finishing touch - those amazing eye frames twisted whimsically out of copper wire - again in the same shade as the rest of the look. It was show-stopping for me and I still get goosebumps when I look at these images. While the collection did showcase 3 menswear looks, it was the women's garments that stood out for me. Luxurious fabrics from shiny to matte, intricate detailing and those great styling notes created from copper wire and copper leaves all came together seamlessly on the runway. 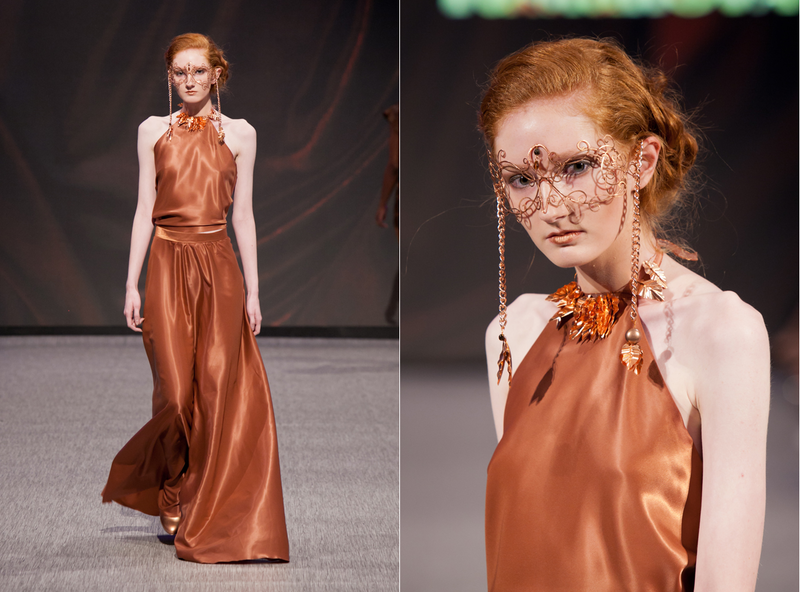 Here is an excerpt from the designer's VFW bio that gives a bit of information about this line - "The collection presented in this show is a blend of gentle evening dresses and original jewelry made ​​of copper, a unique metal that has useful and healing properties. The clothing, tiaras, necklaces and other decorations all enjoy matching detail that make the entire outfit come together with a special unique harmony." Tumanova has shown on the runway at Belarus Fashion Week, MSK Fashion Week, PLITZS New York City Fashion Week, JM Spring Fashion Week Singapore and been invited to show in Colorado, Singapore and Dubai. She has created garments for stage clothes for bands and dressed celebrities from many different countries. What a pleasure that she came to Vancouver to give us a chance to experience her work.